Some say a successful Air Jordan 4 (IV) Retro release must contain a mesh side panel, but this is not true. Here is the Air Jordan 4 (IV) Retro White / White – Chrome. 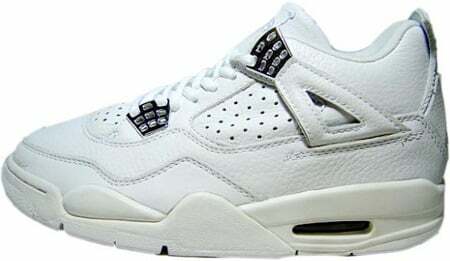 The Air Jordan 4 (IV) Retro White, White Chrome released in 2000s. The Air Jordan 4 (IV) Retro White Chrome features a dominate White upper, and Chrome on the heel and tabs. At the time you can purchase the pair for $100 or less. Now the Air Jordan 4 (IV) White Chrome can go for a $250 and up.